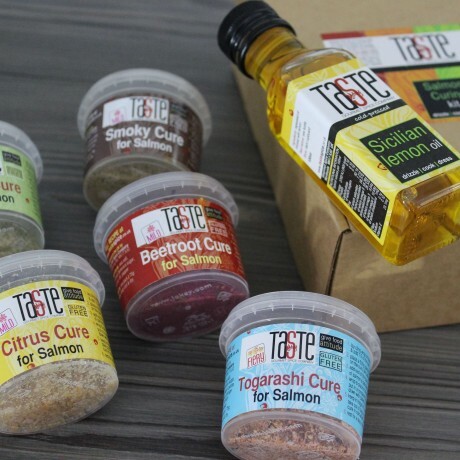 Our NEW Salmon Curing Kit is an easy way to get curing respect! 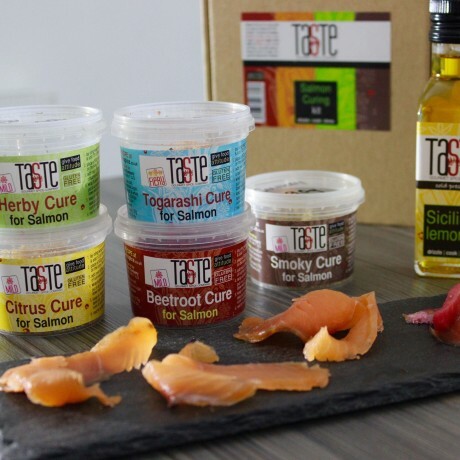 All you do buy is the salmon & follow the simple steps to create the best cured salmon you've ever tasted. This kit is incredible value and will cure around 2.5kg of salmon! The kit contains 5 fantastic cures, a 100ml bottle of our gorgeous Sicilian Lemon Oil, curing bags & full instructions to get you going. Anyone can do it. Home-cured salmon is so much better than shop-bought. Not only does it taste incredible, it’s so much cheaper & you can play around with new flavour combinations to really get your tastebuds going. Not to mention the kudos you get when you take your creation to a dinner party - do it just once & you’ll be asked to provide the salmon for every occasion you go to! Follow these simple steps & with around 10 minutes effort you’ll have lashings of freshly cured salmon in just 2-3 days. Beetroot cure: beautifully vibrant in colour with an incredible earthy, sweet taste - one of our favourites! Sicilian Lemon Oil: a few drops of this drizzled on the finished salmon gives a gorgeous zing. The finishing touch! With five different flavours to choose from, which will you try first? 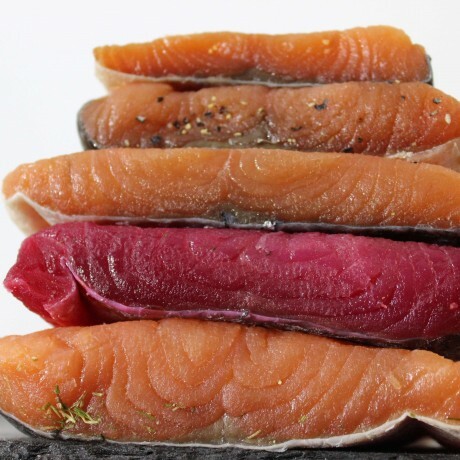 Buy a 400-500g fillet of the freshest salmon you can from your fishmonger or supermarket. Ask them to pin-bone it or do it yourself with tweezers. Lay a sheet of clingfilm over a plate & spread 1/3 of one cure on it, the size of the fillet. Place the salmon fillet (skin-side down) on top of the cure & then cover with the remaining 2/3 of the cure. Pat down all over to make sure the fish is covered. Fold the clingfilm over it & place it inside the bag, squeeze out the air & seal it. Put in a bowl or tray with 2-3 cans on top to weigh it down & place in a fridge. Leave for 2 days. Unwrap, rinse carefully under a cool tap, gently rubbing to remove the cure. Pat dry & leave uncovered in the fridge for 1 more day to firm up, or eat now! Thinly slice on an angle, stopping at the skin. Put the ribbons of salmon on a plate & drizzle with a few drops of Sicilian Lemon oil. Take a picture for Instagram, then enjoy. This is the basic technique but you can mix it up a bit by adding 1 tbsp of vodka, gin or rum to the cure too, or even some fresh herbs. That's it! 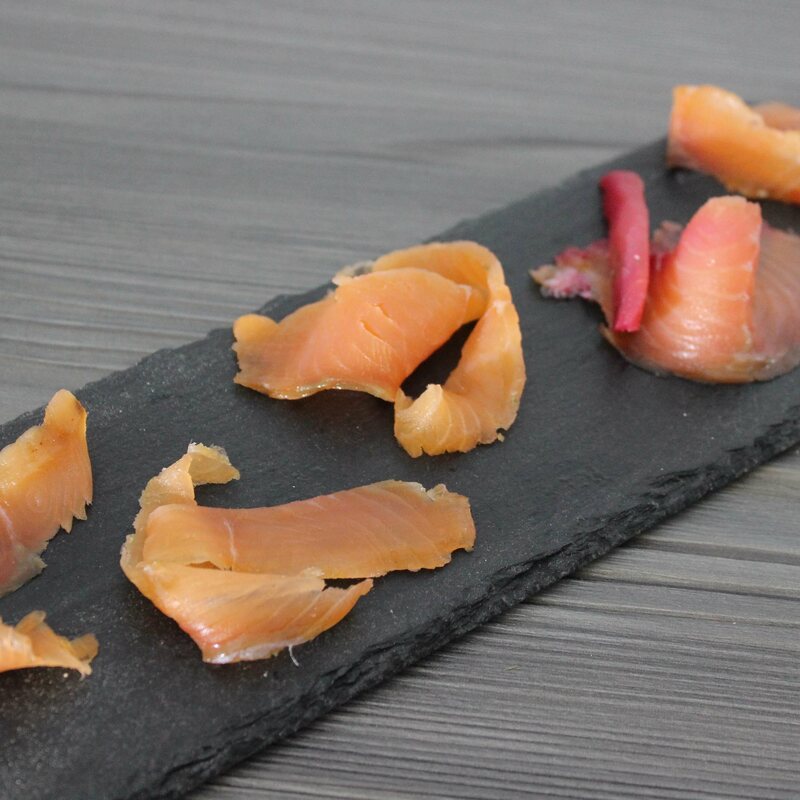 Just 10 minutes effort & 2 days of patience will reward you with the best cured salmon you've tasted! This product is dispatched by Gourmet Spice Company. This item has a shipping weight of 950g.